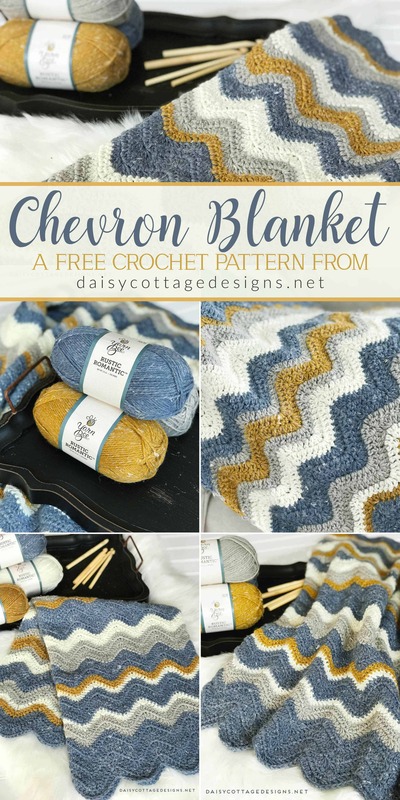 If you want to skip to the good stuff, you’ll find the chevron blanket crochet pattern down below my description and wordy intro. Purchase an Inexpensive, Ad-Free Version of this Pattern here. 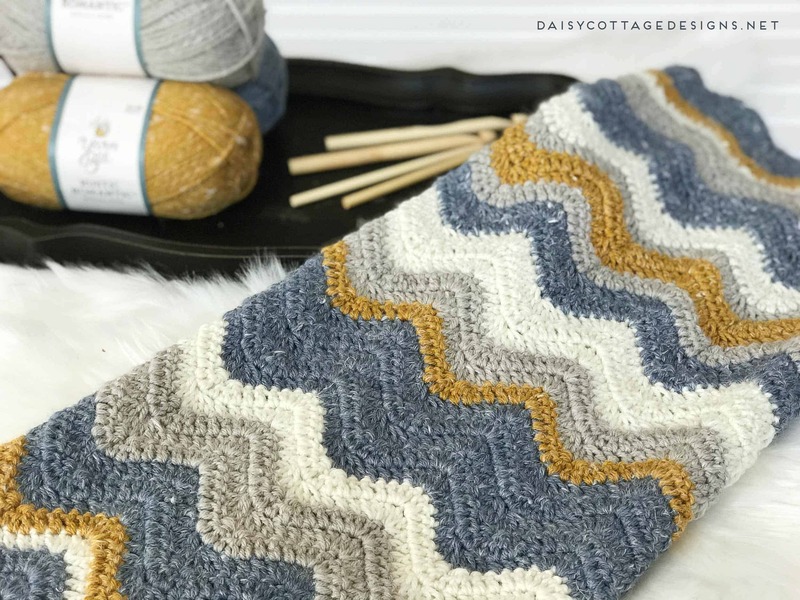 When I saw my friend Rebecca from Little Monkeys Crochet post her Malia Cowl in a beautiful mustard color, I knew I needed to 1) try the pattern one day and 2) make something with that yarn in the very near future. 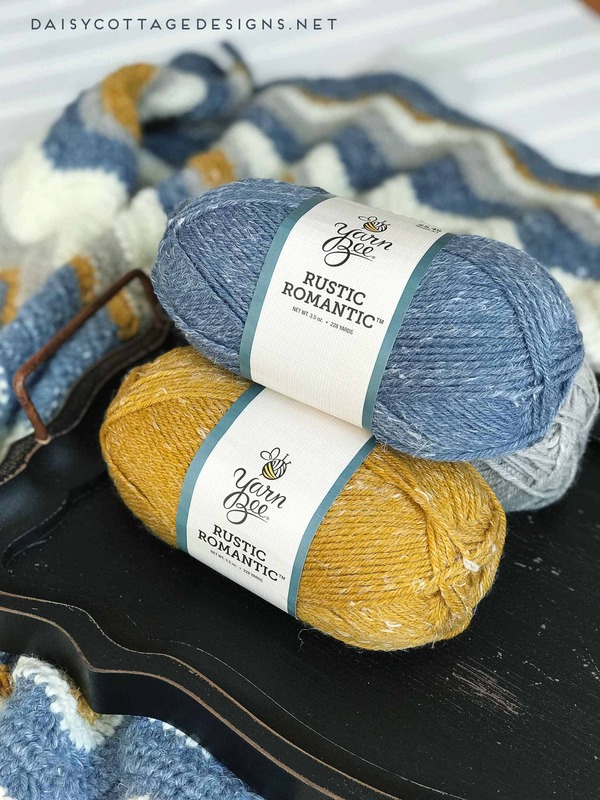 When I was perusing our local Hobby Lobby, I saw a similar yarn and grabbed a few skeins in some gorgeous colors. 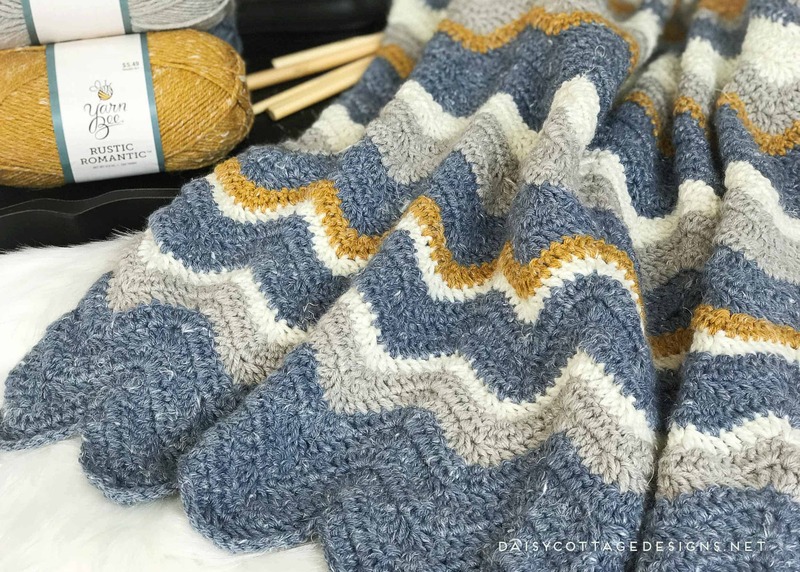 I was happy to find that when I checked her site, it was the exact same yarn! Yarn Bee is a brand that I’ve only ever found at Hobby Lobby. (Side note… let’s not turn this into a political or religious fight about whether or not we should shop at Hobby Lobby, ok?! We’re just talking about beautiful yarn here.) I’ve used several varieties of this yarn and I’ve been pleased each time. This yarn is a little bit different than most that I’ve worked with. It has natural feeling fibers worked into it. Even so, it’s soft, and the drape is beautiful. I will most definitely be working with this yarn again. 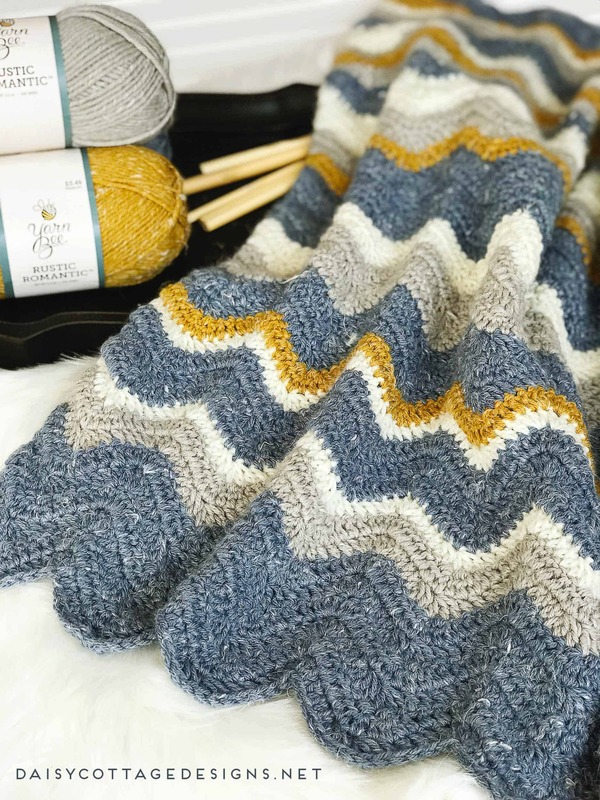 For this blanket, I decided to go with a random stripe pattern. I tend to gravitate towards things that are very ordered and even, but sometimes I like to encourage myself to go outside of my normal comfort zone, so to speak, and try something a little bit different. I chose to use more blue than any other color because I wanted this to feel like a blue blanket overall. I’m not sure that I accomplished that, but I’m very happy with the finished result. Can’t make this right now? I Crochet hook – the bamboo hooks in my photos are available here. Instructions for adjusting the size of this blanket are given at the end of this post. dc3tog: yarn over, insert hook into the next stitch. Pull up a loop. Yarn over, pull through the first two loops on your hook (you will still have one loop on your hook). Yarn over, insert hook into the next stitch, pull up a loop. Yarn over, pull through the first two loops on your hook (You should now have three loops on your hook.). Yarn over, insert hook into the next stitch. Pull up a loop. Pull through the first two loops on your hook (You should now have four loops on your hook.). Yarn over, pull through all 4 loops on your hook. Using Blueberry Bushel, chain 114. Row 1: work 2 dc in the 3 chain from hook. dc in each of the next 3 chs. dc3tog over the next 3 chs, dc3tog over the next 3 chains (yep, you do this twice). *dc in the next 3 ch, 3 dc in the next ch, 3 dc in the next cha, dc in the next 3 ch, dc3tog over the next 3 chs, dc3tog over the next 3 chains* across to last 4 chains. dc in the next 3 chs, 3 dc in the last ch. Ch 2, turn. Row 2: 2 dc in the first st, *dc in the next 3 sts, dc3tog, dc3tog, dc in the next 3 stitches, 3 dc in the next st, 3 dc in the next st* across ending the last repeat with 3 dc in the top of the ch 2 from the pervious row. Repeat row 2 until your blanket is the desired length. My blanket has 51 rows and the stripe pattern is as follows. This blanket measures approximately 25″ x 31″. 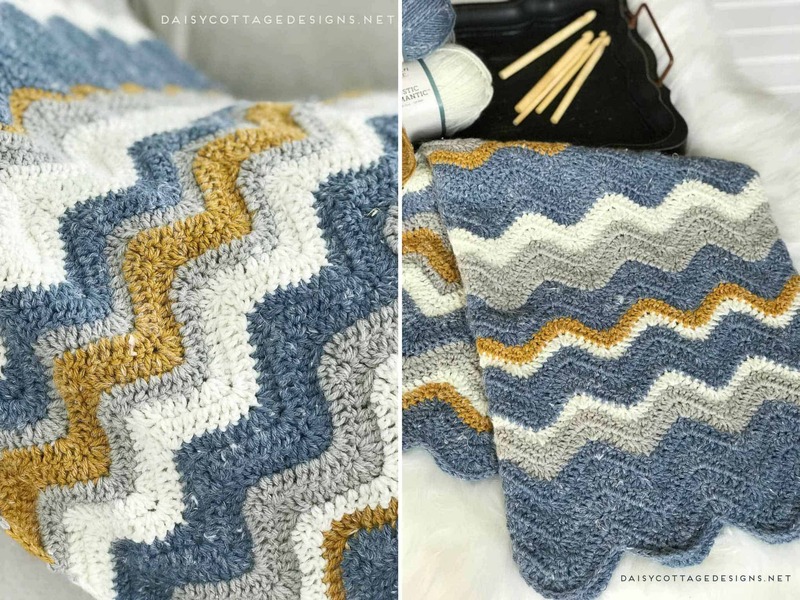 To make this blanket in any size you want, you’ll need to have your starting chain in multiples of 14 + 2.